There are many oscillatory phenomena in the Sun which show up from the deepest interior layers to the outermost layers of its atmosphere. The study of these waves is a fundamental problema in solar physics. It is believed that the waves play a key role in the energy balance of our star; they are one of the candidates proposed to explain the high temperatures measured in the chromosphere and the corona of the sun. Also studying the oscillations is a way of characterizing the structure of the Sun using seismological analyses. Stars like the Sun show different types of waves. Some are acoustic waves, similar to those on Earth, which allow us to hear sound. However the presence of magnetic fields gives rise to new types of waves with different properties. A sudy led by researchers at the IAC and published recently , and picked out as a “highlight” by the journal Astronomy & Astrophysics [A&A above], has studied the propagation of these waves in sunspots and has identified the presence of oscillations in spiral form which start out from the darkest part of the sunspot, called the umbra, and spread into the outer regions, the penumbra. Sunspots are caused by strong concentrations of magnetic field, visible on the solar disc as dark regions, so that these waves can be interpreted as evidence for magneto-acoustic waves which propagate from the interior of the sun out to high layes of the atmosphere, along the direction of the magnetic field. This work has used data from the GREGOR telesope, at the Teide Observatory [above], which, with its diameter of 1.5 metres, is the biggest solar telescope in Europe. 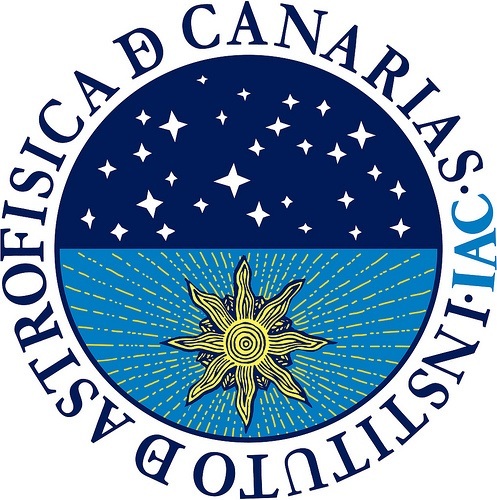 “ The possibility to use several instruments at a time with the GREGOR has allowed us to obtain the variations in velocity in a two dimensional region, and also a spectropolarimetric map of the sunspot observed” explains Tobías Felipe, the first author of the article, an IAC researcher. “The analysis of the polarization of the light is fundamental for the study of solar magnetic fields; we have been able to work out the geometry of the magnetic field of the sunspot, and relate its orientation to the apparent direction of propagation of the waves”. Although previous studies had identified the presence of spiral waves in sunspots, this new study permits the interpretation, for the first time, of these wafes in the contex of a full characterization of the topology of the magnetic field of the sunspot where they are observed. This has allowed us to reject the idea that the spiral is a consequence of the twisting of the magnetic field lines. “The new results suggest that this is the visual pattern of the waves which are propagated upwards from interior layers. Although apparently these waves move in the radial direction, towards the exterior of the spot, what actually happens is that in the outermost regions the front of waves arrive later to the atmospheric layer where they were observed”, says Elena Khomenko, a researcher at the IAC and a co-author of the study. This work was carried out in the framework of an international collaboration, in which there was participation by researchers from a German institution (Christoph Kuckein, Leibnitz Institut für Astrophysik, Potsdam) and an Israeli institution ( Irina Thaler, The Hebrew University of Jerusalem).